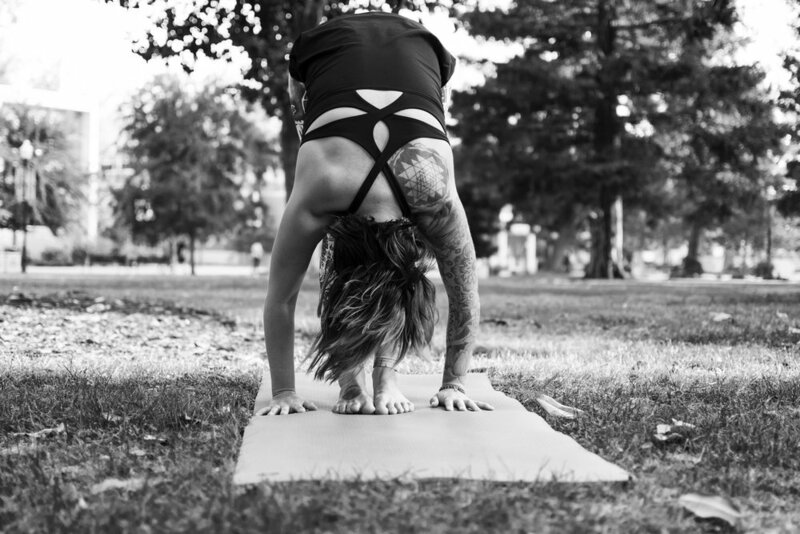 This post is for anyone out there who is new to yoga and needs help finding a great yoga mat. Here are some things to consider before your purchase one. 1. How much do I want to spend? You may be limited by your budget, and I totally get that. If you can only afford to spend $15-40, you’ll be able to find a mat at Target or Amazon that will work just fine for you. But if you are feeling like you want to continue practicing yoga for a long period of time, I encourage you to set a budget and maybe even save for a few months so that you can afford a better mat. Be ready to spend up to $100 for a high-quality mat. If you’ve been practicing for a few months but you’re noticing joint pain or slipping during class, or maybe you’ve had a cheap yoga mat for years, give yourself this gift of a comfortable mat. Maybe you cut out your daily trip to the coffee shop, pack a lunch instead of eating out, or have drinks at home instead of the bar, to save up. In my experience, mats that are more expensive tend to be of a much higher quality, and will last much longer. I think it’s a worthwhile investment, and once you get used to having a great mat, you’ll notice a big difference. 2. What style of yoga will I be using this mat for? If you’re practicing in heat, consider that sweat will make your mat slippery very quickly. 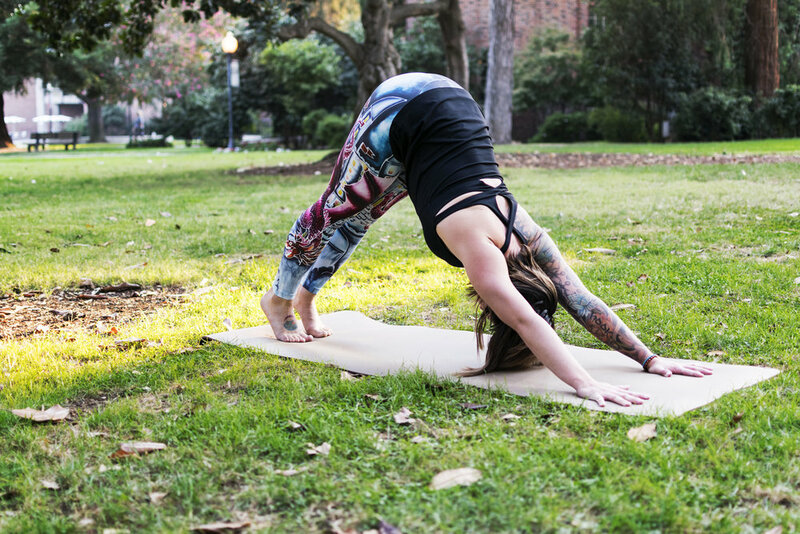 Either you’ll need a good grippy yoga towel to put over top your mat, or you’ll want to find one that’s made to be used in a hot environment. Some mats absorb sweat as you practice, or they have a velvety texture that holds moisture and prevents slipping. If you’re practicing in a non-heated environment, you actually probably wouldn’t want a mat that’s made for the heat. If you want something that you can take to both hot classes and non-heated classes, having a yoga towel on hand can be helpful. 3. Where will I practice with this mat? If you’re traveling back and forth from home to the studio a lot, you might want a lighter mat that’s more compact. Also keep in mind that some mats are not meant to be kept in a closed environment like a car or trunk if the weather is hot (plus, some plastic-y materials will stink and/or melt if they are heated up too much). Think through where you will keep your mat (how much space it takes up) and how heavy it is. 4. Will I be practicing on my yoga mat indoors or outdoors? If you’re buying a mat that will be used on-the-go like at parks, beaches, or pavement, you may want something a little more durable and substantial. I also suggest investing in a good spray cleaner or some mat wipes so that you can easily clean your mat after each use. 5. How much cushioning do I want? Mats come in a variety of thicknesses, depending on how cushy of a feel you want. Thickness generally adds comfort, but it also adds weight, so if you are going to be moving your mat around a lot, it can add hassle. If you do have a heavy mat, a mat carrying bag or carrying strap can make it easy for transport to and from your studio. Consider trying out the mats your yoga studio offers, to see what you like. You could also ask a friend to borrow theirs, do some research online, or visit a store which has a few different types of mats to try.